The small village Airola (21 inhabitants) is surrounded by chestnut woods near the river Gottero. Located in the heart of the Val di Vara ', which was due to its water quality and its specific agricultural production award for the' Organic Valley'. The house has two terraces from where you can enjoy a beautiful view of green hills and the mountain Gottero. La Fiorita consists of a kitchen, bathroom with shower, a laundry room, two bedrooms with double beds (each 1.60 m), a bedroom with two single beds that can be pulled out and put next to each other, and a living room. You can drive from Airola by bicycle Sesta Godano to shop or go drink a coffee in a bar. Here are all shops, bars, restaurants, two tennis courts and a river for refreshening. An ideal destination for those who want to enjoy peace and tranquility in a beautiful original landscape. Here you can on the highest mountain in the area, Monte Gottero (1638m) trekking, rafting or canoeing trip on the river 'Vara' or sea to Levanto. From Levanto it takes only 5 minutes by train to the famous Cinque Terre, which are among the world cultural heritage. The owner offers five mountain bikes and also a baby cot with high chair. Four sun chairs/beds. There is TV with satelite (you can see also english programms). There is also a DVD-Player. The house is adequate for elderly people but there are steps. We loved our week in the Ligurian hills. We went to the beach at Levanto on most days, though visited the Cinque Terre as well which is 5 minutes from the Levanto station. We were wonderfully well looked after. The garden area is beautiful as are the two terraces. Excellent outdoor space. The kitchen was very well quipped, bathroom was very modern and the rooms were all lovely. A fantastic place. We had the most wonderful stay at "La Fiorita" and words cannot really express how much we enjoyed it. It is the most peaceful place, no traffic noise as Airola is just e small hamlet and the cars are parked down in the small square. The only sounds are the birds and people working in the fields. We really enjoyed having the 2 terraces where we had all our meals, plus 3 other sitting our areas in the beautiful garden. We were here with our Daughter and her Husband and it was ideal for us all as we could find space to ourselves if we wanted it. The apartment is spotlessly clean with beautiful views from the dining area and bedrooms. The photos on the web site do not do it justice. Stefania and Valerio met us at the property and everything happened as the instructions said it would. They were so kind to us, giving us a bottle of wine and special sweet bread from the region. Also we were told to just help ourselves from the bountiful garden. We enjoyed walks nearby, swimming in a lovely swimming hole 5 minutes walk away, visiting the markets and exploring the hill top villages. We went down to the Cinque Terre Coast one day but unfortunately the 5 village track walk was closed but we had a lovely lunch near the harbour at Vernazza. The use of the bicycles was also very much appreciated. If you want to go to the beach regularly it is a bit of a drive, also if you like plenty of action and night life you will not get it here, but for a really relaxing holiday it cannot be beaten. We would love to return one day and would have no hesitation in recommending "La Fiorita" as a great place to have a peaceful holiday. Over many years we have been blessed to stay in many beautiful dwellings in wonderful settings, all over Europe and Britain especially, but in other parts of the world as well. La Fiorita here in Airola, tucked exquisitely in the mountains behind Liguria's Cinqueterre Coast, is without question equal to the very best. Stefania and Valerio are generous and gracious hosts, and went out of their way, respectfully and unobtrusively, to make our stay in their gorgeous house in this dearest of hamlets, incredibly comfortable, relaxing, friendly. Just total luxury of surroundings, in yet another new experience for us, the high hill country of Italy. We use a number of excellent sites for finding accommodation as we travel ( been 'on the road' seven of the last eleven years, with extensive travels previously), and everything about La Fiorita has been listed and handled easily, perfectly. Sometimes we find photos and descriptions flatter a place a little ; in this case, nothing can quite capture its perfection. So from the gentle comfort of house and garden, the numerous places outside and in for four of us to hide away individually when we wanted, (not to mention every little convenience and necessity within the house), to the labyrinth of winding roads connecting village after scenic, atmospheric village, to the available fine foods and wines, to our fourth visit to the unmatchable Cinqueterre, this has been a week to rank at the top of our travel highlights. Heavenly Home in an Italian Paradise! 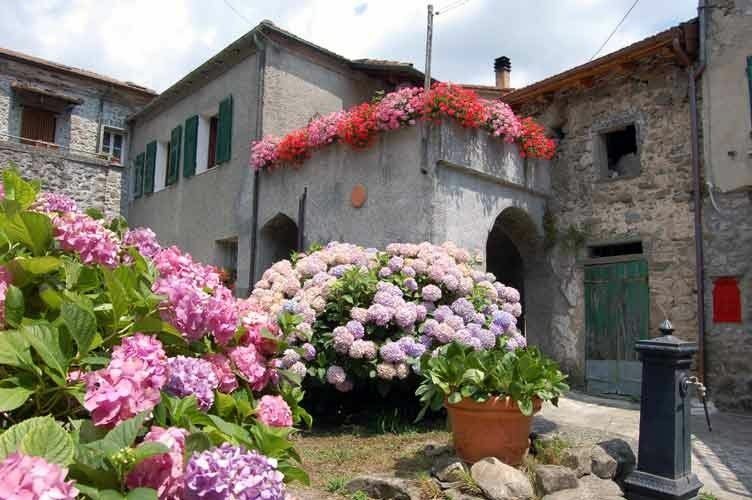 We were drawn to La Fiorita mainly by the beautiful photographs in the listing, but a camera can't capture just how *wonderful* this Italian paradise is! We felt at home, right way, thanks to the warm welcome we received from Stefania and Valerio. They met us outside and led us to the handsome house, gently nestled in nature and wrapped in gracefully aged Italian stone. Inside, a charming and beautiful, well-kept, cozy home awaited us, lovingly decorated throughout with artistic attention to detail...from needle-pointed pillows and hand-woven lace curtains... to warm wood-paneled closets...and even the original kitchen, pristinely preserved with its wood-burning cook stove -- (bringing back memories of my own Italian "Nonna!") The more modern working kitchen features a huge window which opens out to a picture-perfect view of the mountains -- and a gorgeous garden, bursting with its beautiful bounty! Stefania and Valerio urged us to help ourselves, as we like -- and as we talked, Valerio proceeded to pluck bright, juicy vegetables which he piled into a basket, pretty as a picture! (And even more delicious!) And that was just the beginning! We enjoyed candlelight dinners on the back terrace, and breakfast on the front terrace -- such a treat to have two, each with its own delightful view! Each day, we went adventuring around lovely Liguria, and it was all at "arm's reach!" Less than half an hour's drive to Levanto, where we took the train to Cinque Terre and hiked the trails between the villages.. On another day, Portofino and Santa Margherita...We never ran out of adventures -- just days to do them! And each night-- we would arrive home to discover marvelous surprises at our doorstep -- courtesy of Valerio! Ripe, sweet figs (the sweetest ever! )...big, beautiful funghi (amazing Italian mushrooms!)... fresh-picked lettuce and plump, juicy tomatoes... It was like coming home to Christmas, every day! Valerio was better than Santa Claus!! We only wish we could have stayed longer.... We can't wait to return-- and we will!! Grazie, Stefania and Valerio!! Signora Stefania und Signore Valerio sind außerordentlich nette und hilfsbereite Gastgeber, Annette d'Alfonso hat uns großartig unterstützt. La Fiorita im April (zu einer anderen Zeit kennen wir es leider noch nicht) ist traumhaft für eine Auszeit vom Alltagsstress: Die Wohnung ist sehr charmant und top ausgestattet, Garten und Terrassen sind sehr gepflegt - wir (2 Erwachsene, 2 Kinder mit 12 und 10) haben unseren Aufenthalt sehr genossen und kommen wieder. Un très bel accueil. Après une visite de l'appartement, nous nous sommes rendus aux terrasses, au jardin et au potager, dont sommes repartis les mains pleines de légumes. L'appartement est très agréable, d'une belle décoration et rien ne manque pour y passer un excellent séjour. Ajoutons à cela que le temps était de la partie, ce qui nous a permis de profiter pleinement de nos vacances et des visites environnantes. Un grand merci pour l'accueil et de nous avoir permis de tant profiter de notre séjour. The 'Rivera di Levante' east of Genoa is one of the most beautiful piece of the Italian Riviera with densely wooded hills and mountains, deep coves and picturesque villages and towns by the sea. Airola is 4 km from Sesta Godano away. Sesta Godano is a quiet, natural market towns in the interior and is situated 17 km from Levanto, a lively town with a wide sandy beach on the Ligurian coast. Monterosso al Mare, a few km from Levanto, situated in a lush valley that opens onto the sea and forms a beautiful bay. The Cinque Terre, one of the most famous and beautiful attractions for hikers are just minutes away from Levanto by train. Equally attractive starting points on the sea are Sestri Levante, Lerici, Porto Venere, also because of the excellent Ligurian cuisine, which is minted in full from the sea. Lucca and Pisa are in 1 hour, Florence reached in about 1.5 hours. - 25 % Anzahlung und den Rest in bar oder zwei Wochen vor Ankunft - 25 % commission and the rest in cash upon arrival or two weeks before arrival. - Endreinigung extra: 50 € (6 Personen 60 €) in bar bei Ankunft - Final cleaning extra: 50 € (6 persons 60 €) in cash upon arrival - Service der Bettwäsche und Handtücher auf Anfrage: € 15/Pers. - Bedlinen and towels on demand: € 15/pers. - Kaution: 200 € in bar bei Ankunft - safety deposit 200 € in cash upon arrival - Es gibt eine Heizungspauschale (Pellets-Ofen) pro Tag von 6 € -12 €, abhängig von der Saison - Heating: there's a charge of 6 € -12 € per day depending on the season ---------------------------------------------- Wir bitten Sie um Verständnis, dass in der Hochsaison nur nach dem Wochen- und nicht nach dem Tagespreis gerechnet werden kann. Also bei einer Buchung von 13 Tagen würden wir dennoch 14 Tage berechnen. Danke. We hope of your comprehension that in high season we calculate only per week and not according the daily price. For example a booking of 13 days will be calculated still with 14 days. Thank you.